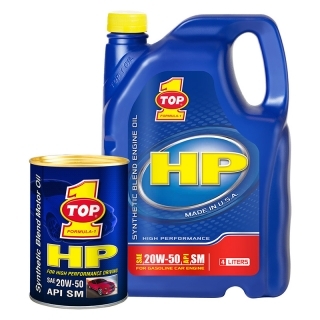 TOP 1 HP 20W-50 is a premium synthetic blend motor oil formulated with our state-of-the-art additive package to provide superior wear protection for modern engines. TOP 1 HP 20W-50 is fortified with detergent-dispersants to keep engines exceptionally clean and free of harmful engine deposits. Performance additives including corrosion inhibitors, rust inhibitors, and antioxidants impart high oxidation stability to protect engines from oil thickening, sludge buildup, and varnish deposits.